This badge was issued to Sol Toder on 08 Dec 2017. The badge earner has mastered basic mainframe concepts. This individual is able to perform extensive programming (advanced commands, system setup, and advanced system navigation) and application developing (C, JAVA, COBOL, assembler and REXX) tasks, as well as having hands-on experience with multiple operating systems (Linux on z Systems, z/VM, z/OS, z/TPF). 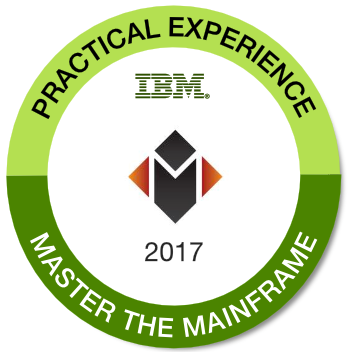 Completion of the IBM Master the Mainframe - Part 2 contest for 2017.